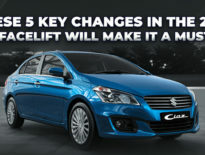 The mid-sized, executive sedan of Maruti Suzuki – Ciaz facelift will have a new 1.5-litre, K15B petrol engine. Seems like, Maruti is busy in testing the car on Indian roads. It’ll be the automaker’s one of its own kind car in India to have SHVs technology in the petrol variant. Reportedly, the new car is likely to hit the market anytime soon in July 2018. The all new Maruti Suzuki Ciaz will continue to retail from Maruti Nexa dealerships. It will be interesting to see how Maruti competes with three of its daunting contemporaries such as- Honda City, Hyundai Verna and of course the Toyota Yaris. Here are some key features of the car to get fall for right now. Explore the new design – Ciaz has been the undisputed king of C-series sedans manufactured by Maruti Suzuki which had been first introduced in 2014. The new variant of Ciaz is going to have some significant changes in its exterior and interior design. The new model will have a sporty touch in slick outline. However, the biggest change so far announced is the replacement of the Ciaz’s 1.4-litre K14B petrol engine. The engine is adept of generating 104 BHP of power along with 138 Nm of top torque. It gets a 5-speed manual transmission in addition to the option of an automatic gearbox in the same way. It will likely come with a slimmer radiator grid and the bumper will get chunkier. This car will come with newly designed 16-inch (highest z variant only) alloy wheels. Also, the fog lamps will be brand-new. At the back end the car will have an updated bumper with new trial lamps. This corporate sedan will surely grab all the attention as it’s priced lesser than Hyundai Verna and Toyota Yaris which means a compact sedan, loaded with modern technology can be yours within your budget. So, when it comes to value for money, Maruti Suzuki Ciaz takes in a resilient instance for itself. All colours of Ciaz Facelift 2018 (Nexa Blue, Pearl Metallic Dignity Brown, Pearl Sangria Red, Metallic Silky Silver, Metallic Glistening Grey, Pearl Midnight Black, and Pearl Snow White) are available in the best Nexa car showroom in Ranchi. Explore the designs, reviews, image, Ciaz colours, and new Ciaz price click here. What are you waiting for? Pre-booking is going on in full swing! Visit the best Nexa car showroom in Ranchi now.